January 1, 2017 – HAPPY NEW YEAR! The First Day of the New Year. “Staring down a greasy taco plate; bowl of menudo on the side… We were drinking and swinging from the chandeliers…” Ah once upon a time, but no more, but thank you Roger Creager for the memories. Before I get to my 2017 Predictions, I wanted to share a few really cool gifts I received for Christmas. This first one came totally unexpected. I like those so much – especially when the gift is spot on! While the giver knows my love for cameras, what the giver does not know is that this scency is a replica of the first camera I ever learned to use at Magnolia High School in 1966-67. Imagine this happening today. The Conroe Courier gave every yearbook editor in Montgomery County one of these very expensive cameras to use for the year provided we attended a Saturday morning class on how to use it. Yes, photography peeps, they trusted a group of teenagers with state of the art, news reporter quality, Leica lens cameras. We were to use the camera to take photographs of school events – aka football games! Such good memories and I am going to be hitting my house with the smell good in 2017. I liked this too. Angry Mama to clean your microwave. As dirty as my microwave is she will probably explode the first time she tries to clean mine. I wonder if she comes in an Angry Mama to clean your house. Here is a favorite. I got this combination science and magic kit. It seems that the elixir on the left has magic potions of St Belvedere. When poured properly into the magic beaker on the right, the perfect tini temperature is achieved. I cannot wait to try it. It was gift from Pootie and Russians to commemorate taking Poland in 1945. And now my 2017 New Year’s Day Predictions – just for the first month or so. Donald Trump will be sworn in via Twitter. All of the Kardashians and their exes will perform at Donald Trump’s inauguration. I don’t know what they are going to do. What they always do, I suppose, nothing, but dress up and post their photos in Instagram. Kate McKinnon and Alex Baldwin will not perform at Donald Trump’s inauguration, but will continue to make us laugh on SNL. So love you, Kate! Rick Perry will lead the dancing at the Inaugural Ball for President Donald and First Lady Melanoma. Donald Trump and Vlad Putin (aka Pootie) will dance via distance learning a Bromance line dance like Cossacks that creates a viral meme at 3:00 am in the morning. Warning: Putin will be shirtless. Dancing with the Stars will once again bring us in high definition broken down, old stars, and never heard of before people trying to learn to dance while wearing sequins and feathers. On January 9, 2017, from Raymond James Stadium in Tampa, Florida for the National College Athletic Association Division FBS 2017 National Championship, invented by Larry Culpepper, we have the Crimson Tide from Alabama versus the Tigers of Clemson from South Carolina. Sidebar: Thank goodness the announcers are the always professional team of Chris Fowler, Samantha Ponder, Tom Rinaldi and my boyfriend want to be, Kirk Herbstreit. Can’t wait for ESPN Game Day this fall. Please come back to Aggieland. And my prediction: ROLLLLLLLL TIDE! Like I even know anybody who even claims they went to Clemson and I don’t like orange in any shade. Dak, Eskielle and The Boys will win Super Bowl LI (what number is this in Roman?) in Houston in NRG Stadium – home of the Houston Texans. Houston and Texan fans will hate Dallas and The Cowboys even more. Hey! For you non-native born Texans – It’s about oil ya’ll. Football is just a hobby to show off. Time to go have science experiment, practice Russian and eat black eyed peas and cornbread. Happy New Year’s Day! Sam Houston State Bear Kats –Alma mater to degree # 2. All SHSU sports are covered by the TV channels in Bryan – so cool. Teach me some cheers, Telisha. Northwestern – go DEFENSE! Cousin Darryl (but not my other Cousin Darryl) is Defensive Coordinator. Go Demons! But not against SFA or Sam Houston! Texas Tech – I shall anxiously await my case of tortillas. Will they be arriving by Fed Ex or a TT EX on a horse? Please know I will throw them at the TV when TT plays OU and those other schools like Kansas and Iowa State that really need to concentrate on basketball. Go Kliff! Alabama – I hope my readership does not fall off either, JH. I was under the impression that the four from Alabama and/or who support the Tide and who actually read HWIT represented the entire literacy of the state. Just to clarify you know I will yell “Roll Tide” when you meet Auburn, South Carolina (or any school coached by Uncle Will “Exploding Head” Muschamp), any school from Florida and any team that Bama plays that will help Texas A&M look better in the SEC West. Also, should Larry Culpepper be hawking Dr. Peppers as Alabama prepares for another National Championship in January, I will put Roll Tide on my banner. Texas A&M – Alma mater to degree #3. Being an equal opportunity Snark my Aggies get an entire post tomorrow. Some Bad Bull. Short paragraphs about whatever I am thinking. I like to think about my favorite topics: College football, the state of Texas, the public school educational institution, politics and life in general. Refining that somewhat further, I write about Texas Aggie Football. In addition I write about teams I like and teams that play teams I like. This includes, but is not limited to, LSU, selected schools in the Southeast Conference, and any team playing any football team from Florida. I like teams from the Big Please Come to My Party Conference, formerly known as The Big XII. But I only like these schools Baylor, THE University of Texas, and Oklahoma State University. And I root for the Lumberjacks of Stephen F. Austin in Nacogdoches and Northwestern in Naco’s brother’s founded town of Natchitoches. And I root for the Bear Kats from Sam Houston State. First though – you Crimson Rolling Tide bunch of hackers – When I wrote in January of 2016 “Happy Birthday to us all. Roll Tide”, it was to cheer for the National NCAA Division I Football Championship. Somehow it became part of the banner. 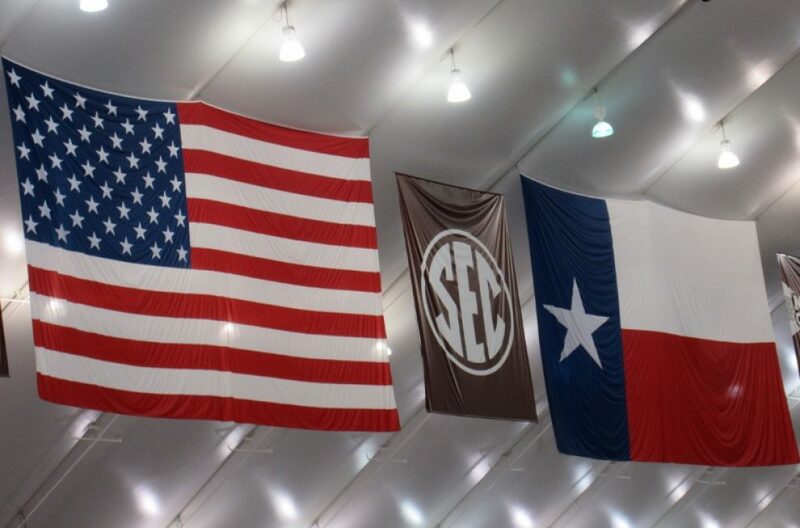 It was not supposed to stay up there until July 4 – when I first realized it was still in banner – just above the 12th Man. When I inquired from one of Tide Rollers, as to how long it had been there, I was informed “months” making my horror and shame deepen. They continued “We wondered when you would find it.” Then it took a month to figure how to remove it. Do not expect to see Roll Tide on the HWIT Banner unless it is for another National Championship. BTHO UCLA – September 3, 2016 Kyle Field; 2:30 CBS Gig ‘Em.